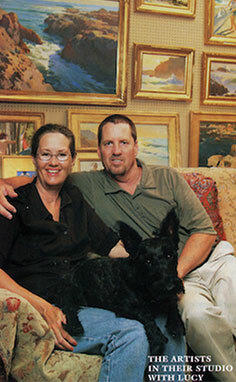 You’re married, you’re both painters, and you share a studio in Angel’s Camp, CA, which is near Lake Tahoe? Peggi: We’re two hours from San Francisco, two hours from Lake Tahoe. How does it work out, sharing the studio? Peggi: It’s the neutral zone. Do you work at the same time? Peggi: We both know to say, “That looks fabulous. That’s gorgeous.” Maybe one little blurt, but that’s it. We don’t critique each other’s work heavily at all. That’s why it’s worked so well. Who’s the neatnik and who’s the slob? Peggi: I’m a little neater and tidier. He’s Mr. Messy. Do you share paintbrushes and paint, or is that too much togetherness? Ray: Yeah, we have common supplies. We’ve got thousands of dollars worth of paints. Who chooses the music to play while you’re working? Ray: I listen to talk radio mostly, occasionally rock-and-roll. Who’s the speedy one, and who’s the slowpoke? 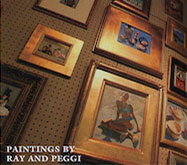 Ray: Peggi does more paintings. But mine are larger. Who get the phone when it rings? Peggi: Ray loves the phone. I hate the phone. Who talks the most, and who says, “C’mon, I’m working”? Peggi: He can chatter and work. He talks to the model. I can’t. Peggi: Ray does. But I do more laundry. You’re based on a small ranch in the foothills of the Sierra Nevada mountains, with horses, chickens, cats and dogs? Peggi: Not anymore. We had 25 chickens running around, and we said, “We can’t do this anymore.” We’ve been traveling so much, we just couldn’t tend to them. We kept four hens, and our soccer coach took the rest. We had one horse, Freight, and I gave him to our farrier. But you’ve still got the 200-year-old oak trees outside, and the old gold mines nearby? Peggi: Now they’re becoming boutique wineries. That’s the new gold. And who is embracing the new gold enthusiastically in your household? Peggi: How can you peg that so quickly? But Peggi, I’m guessing you pay the bills. Peggi: You are so perceptive! I do all the paperwork. Peggi: Actually, Ray does most of the grocery shopping and the cooking, if he wants to eat. [Laughs] And he does the computer stuff. And he gets the fire going in the wood stove during winter. Then he’ll come in the house and get the coffee going, and bring his princess a cup of coffee in bed. How’d you come to that town? Peggi: Ray was longing to go back to California after we lived in Scottsdale. I just couldn’t face the droves in Southern. A friend was living up near here, in a charming, wonderful town. We fell in love with it. You’re both impressionists, and you both do plein-air studies, figurative work, still lifes, and landscapes? Ray: Yes, but I don’t do still lifes. What quality must an artist have, and what quality will only do an artist in? Peggi: Must-have quality – self-policing. Bad quality – ego. Ray: Perseverance is good, complacence is bad. What word or phrase do you each overly rely on? On what occasion do you each fudge the truth? Peggi: Well, maybe when I tell him he looks like Hercules. Ray: You’re fudging then? [Laughs] I fudge on the golf course. What trait has served you best in your career, and what trait do you deplore in yourself? Peggi: That I’m a Virgo – it’s served me best and I deplore it. It can be relentless. I’m certain Ray is not a Virgo. Ray: I’m a Pisces. I’m ambitious, but I wish I had better social skills. Which artist, living or dead, would most like to trade a piece of art with? What’s the range that your work sells for? What does an artist need most: a good accountant, a good truck, or a good red wine? Peggi: Yes, a navy blue Suburban. Out there 200 miles from anywhere, I bet you do.